This is an incredible goal. Reducing or eliminating debt helps create financial margin and reduce stress. However, many people make the mistake of skipping straight to debt reduction without first saving money in an emergency fund. This is a HUGE MISTAKE. You see, I made this mistake for a long time. I wanted to kill debt. I was frustrated and angry and wanted to say goodbye to my long-time friend, Sallie Mae Student Loans, the bank, credit card companies, and stores. I wanted the debt to be G-O-N-E. So I ran right past the more important step – saving money. Take a minute to think about it. If you do not save but only focus on attacking your debt with any and all extra money (tax refunds, bonuses, money freed up by budgeting better, etc), you will begin to see your debt go down. Then your car will break down. Choose to save money first. I recommend starting with at least one month of expenses. Once all of the non-house, non-business debt is gone, build the savings to 3 months of expenses. Yes, this slows down the debt pay-off. Yes, it’s frustrating to focus on savings when you have debt (especially when you include interest). BUT if you save first, you will secure your ability to stop acquiring new debt, which is the biggest step you can make towards true financial freedom. Interested in learning more about saving, eliminating debt, and budgeting? 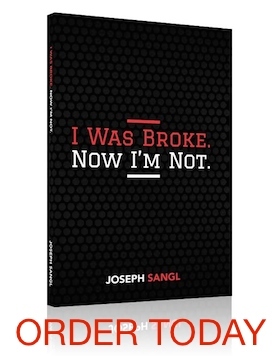 Check out my book I Was Broke. Now I’m Not.